Sorry I’ve been lax about posting. The Attack of The Peanut cascaded into a splendid ER visit and a bad case of Shingles. Nothing to make a gal feel young like a case of Shingles. I now need denture paste and glitter. I am sure there is some mayhem I can create with that 😉 . Oh, and I want an obnoxious pink cane with a tennis ball on the end so I can sit in my driveway and yell at people that they’re driving too fast. Oh, yeah, was going to chat some about writing (in this weird gap I get between waking up and pain meds kicking in). No precise time when THAT happens so should be FUN. Being laid up in bed doped on pain meds gives you LOTS of blog ideas…and seriously weird dreams. How does one translate competing in ice skating against Nancy Pelosi and she wins because she has the better Monster Truck? I REALLY want a Monster Truck. Today we will use an acrostic because they’re cool and keep this ADD teacher/blogger on SQUIRREL! …um, task. Hard Work—Yep, no magical program that can whip out a NYTBSA. But frankly, would we want one? Those in writing for the wrong reasons (make a quick buck) abound. Some succeed but they’re rare. Most of us do this writing thing because of LOVE. We love to write, to teach, to share, to tell stories. We are explorers who can venture into the human mind or into galaxies never before imagined. And no matter where we go, there is coffee. Ok. We laugh at them. But they don’t care and make millions for throwing a ball. Take a lesson. We might be weak at something. Remember that our greatness is only limited by our strongest weakness. We can be a pro at dialogue, but if we have no clue how to plot effectively? We can limit how well we connect to the reader. Still focus on your strengths, but acknowledge and develop your weaknesses so your writing is balanced. Allies—Again, this is why I started WANA. I knew what it was like to be completely alone trying to do this writing thing. I might as well have told friends and family I was pursuing a career in coloring books. The world oddly devalues what we do, yet they spend most of their disposable income on what artists create—music, movies, books, video games, TV, TV series. Writing changes the world. It’s ended slavery, given hope to the hopeless, been the greatest catalyst for equality and often is the spark that lights the scientific innovation. *cough* Star Trek. Thank Gene Roddenberry for that smart phone the world is addicted to. But you will need others to remind you that what you are doing is important. Also, learn to spot allies versus energy vampires. We all have them. People who have problems they want us to solve and then they do what they were going to do in the first place. Use those words wasted on someone who won’t listen anyway and put them on a page. Also, learn to say NO to time-suckers and YES to allies. No is rarely popular, but I’ve learned I would rather be respected than popular. Empathy—The mark of an excellent writer is how well she can get in a character’s skin/head. Study people. Listen. Pay attention. Get in another person’s head/heart for real. What would they think, say, feel? If we fail to do this authentically, readers will spot it. Rhino Skin—I wrote an old post about critique groups someone stumbled across. I mentioned that we gutted each other’s work. This vexed the commenter, but why? I would rather someone be hard on me in private than get slayed in reviews that are for public view permanently. And even if the person is a total jerk? Great training for this thing called reality. There are some reviewers who will post venom for the sole purpose of being mean. I don’t know why. But bullying has always been around and likely not going away. Though I’ve been blessed with wonderful, thoughtful reviews on Amazon, there are people on Goodreads who clearly never read my book who gave me one star just because they could. But, if you’ve been in a critique group of respectable peers who give tough love? @$$clowns are easier to write off (or write INTO a novel). If you can possibly find and join and RWA group? DO IT, even if you don’t write romance. This is the greatest collection of pros you can hope to find. We have to develop discernment (which comments are crap and what’s worthy of looking into), but even if it’s pure jealous hate B.S.? Still useful. Hey, we always need someone to shame/torture/kill in our next novel, right? I won’t sugar-coat. If you write anything, especially anything worthwhile? The haters will flock to you. You are the light that reveals their fear and suckiness. Actually hate is proof we are doing something right. But it will still hurt. I’ve been in martial arts my whole life and getting hit in the face still hurts. I just no longer take it personally. Same with writing. Feel the sting, then let it go….until you can create a plot involving a serial killing H.R. Manager with tragically small man parts or a former coworker with terminal cellulite. Time—Rid THIS phrase from your lexicon. “I can’t find the time.” Time is not the remote control hiding in your couch cushions. Pros don’t find time, we make time. You are a priority and so is your writing. Again, it is better to be respected than popular. I’m not saying these can’t coexist. But, those close are NOT writers. They do NOT understand us and won’t. Most people have no clue why anyone would write anything unless there was a grade at the end or a boss expected it. Before we go, I AM going to mention a series of classes I have coming up in early September. I call them the Going Pro Series. Back to School for AUTHORS. There’s Craft, Branding/Social Media, and Business (which publishing path might be the best fit for YOU/your work). Often we make stuff too complicated. Hey, we are writers. It’s our thing. I am here to help. These classes are designed to streamline ALL you do. In craft, you will learn essentials, how to plot leaner and meaner and write better and faster than you might believe you can. Branding/Social Media? It’s simple and doesn’t take nearly as much time and effort as some might tell you. Business? We writers are in the Entertainment BUSINESS. Which path is a good fit? Not all writers were meant to self-publish. Not all works are good for traditional. This series is a guide to help you accomplish much more with far less effort. Feel free to take one (use WANA 15 for $15 off), but if you take all three in the BUNDLE? The cost is a lot less (and notes and recordings are provided for free for all classes). What are your thoughts? Which parts of the H.E.A.R.T. are hardest for you? Do you put everyone and everything ahead of writing? Are you feeling pressured and strapped for time? Need help going a thicker skin? Feel at war with family or friends over your desire to write? 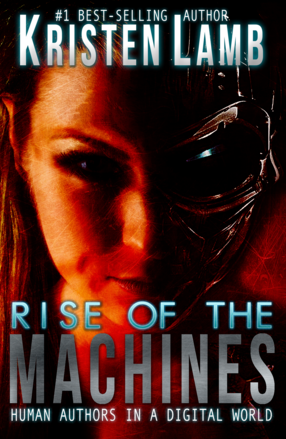 For those who need help building a platform and keeping it SIMPLE here’s my newest social media book, Rise of the Machines–Human Authors in a Digital World is NOW AVAILABLE. Only $6.99. Want to be a writer? Expect suffering. Lose your illusions and embrace pain. Writing is not always a glittery unicorn hug, and we don’t get what we wish for, we get what we work for. This profession is not for the faint of heart, namely because 1) it’s hard 2) it’s often under appreciated 3) great writing requires us to expose our soft tender parts and hope no one carves them out with a spork. I’ve said it before. Just because we have command of our native language in no way qualifies us to create a work of art spanning 50,000 to 100,000 or more words. We need to study, practice, apply what we learn (WRITING), and grow a damn thick skin. No matter how well we write, someone won’t like our stuff. It’s just reality. Ten years ago, I went to my first critique thinking every word I wrote was a rainbow kitten dream. Guess what? The group slayed me–it was all blood, teeth and adverbs. Later, when questioned, no one could positively ID the body (of work). I sat in the parking lot alone crying, but I didn’t give up. How badly do you want the dream? Expect criticism, and get good at taking it…but not taking it personally. Remember, others have a right to be wrong. This is why it’s critical to know your craft. Any whackadoodle can join a writers’ group and give advice. If we don’t know our stuff, then when someone suggests we add a bunch of stupid description or adverbs we can politely thank them…and then gift them a copy of On Writing. Learn all you can and embrace peer review. Writing groups, conferences and workshops are good investments of time and money. If you can’t find a writing group, or you live in an area with no real access to a writing group, hop on to WANATribe and find the tribe that suits you best, or create one. You are no longer writing for fun, Sweetheart. You are writing for keeps, so train like it. Read books, take classes, go over to WANA International and sign up for a class. Boxers volunteer for others to punch them in the stomach over and over and over to toughen their solar plexus so that, when it comes time to hop in the ring, their bodies are hardened and can take a hit. I see too many newbie writers more interested in the “glamorous life” of being a writer, than the grueling pain of the professional, so they enter the “ring” soft, sloppy, and untrained. They treat publishing a book like furnishing a Barbie Dream House, and are more interested in cover art and bookmarks than the quality of the manuscript. Too often, they self-publish too soon and with no peer review. The first bad review they get, they go nuclear and give up. This is a profession, not a playpen. Toughen up. Learn to take a hit and get back up. You know I am here for you guys. I’ve been here for a lot of years and am rooting for your success, no matter which publishing path you choose to take. But real love is tough love. All of these lessons I had to learn, too. I used to goof off, write when I felt like it, constantly start new projects, and daydream instead of getting my @$$ in the chair and writing. I had to put away my Author Barbie Dream House and grow up, too. If I can do it, anyone can do it. Trust me. Social media is critical, but books are the most important. Thrilled you stopped to read this, but back to work. NOTE: December’s winner will be announced when I return from Seattle. So a couple of weeks ago, we discussed critique groups then I saw something shiny and forgot to post the second part of the discussion. ::head desk:: Anyway, in Part One, I posited the question: Can a critique group do more harm than good? In my opinion? YES. Traditional critique groups can have severe limitations, and, if a writer doesn’t understand this and adjust accordingly, then she can do irreparable damage to her WIP and even her career. As a note before anyone gets huffy. Just because something is limited does not mean it is bad. Critique groups, especially GOOD critique groups are worth their weight in gold. But just like my car has limitations–I cannot traverse lakes with it–critique groups are limited as well. Yet, when we understand the limitations, then we can adjust accordingly. Since most traditional critique groups only hear/read a small section of pages at a time, there is no way they can tell if there are major plot problems in a manuscript. Many writers hit the slush pile because their plot has catastrophic flaws. Pretty prose does not a novel make. Agents are overworked as it is. They can love our writing voice, but they don’t have the time to teach us our craft. As professionals, we should have the basics down when we query and it is rude and amateurish to expect an agent will fix everything for us. Not their job. They can fix some surface stuff, but not the deep structure flaws that cause many queries to land in the slush pile. I have met countless writers who didn’t properly understand the antagonist or even narrative structure. They thought their WIP was ready to query because people in critique “loved their writing style.” Just because we have command of our native language doesn’t mean we have the skill set to write a 60-100,000 word novel. Critique groups don’t have the perceptual distance to spot the big problems. So just understand this from the get-go and all is fine. But make sure your plot is critiqued before you query. Also, understand that the group is limited then take critique with a grain of salt. If someone says, “but this spot didn’t have enough action” and you know that those ten pages were part of a sequel and NOT a scene, then you know you don’t need to punch up the pace. Write good books, not 150 individual sections to keep people at critique happy. Traditional critique groups can get us in a habit of over-explaining. Because the group can’t see the big picture, they can inject things like, “But how did Gertrude end up in Disney World with a flame thrower?” Well, of course they don’t understand why Gertrude is setting The Seven Dwarfs ablaze. They haven’t been at critique for three weeks, so they missed the part about a hell-mouth being located under Cinderella’s castle. Why do you think Disney got the land so cheap? And all these years you just thought it was because it was a swamp! When people at critique say things like this, just hold your ground and give permission for some folks to be lost. We have to stand strong here. If you are like me and lean to the people-pleasing side, you must learn to stand your ground with suggestions. I have seen writers have a lovely writing voice literally hen-pecked out of them by people at critique. Just take critique for what it is and accept the good and ignore the bad. Traditional critique groups can get us in a habit of perfectionism. The world does not reward perfection. It rewards those who get things done. No one ever had a runaway success with half of the world’s perfect novel. Lean to be a finisher. Traditional critique groups can give a false sense of security. Again, pretty prose does not a novel make. Is voice important? YES! But voice alone is not a novel. We have to make sure our structure is not a disaster area, and this is where traditional critique groups run into trouble. But today, I will give you guys a way to work within the limitations. How can I get solid critique of my plot? Beta readers are good for critiquing at plot. If you can, find a pal who loves to read and ask for her to read your novel. She can tell you if your book was great, boring, confusing, or made her want to gouge out her own eyes. Just make sure you allow your beta reader permission to be honest, even when it hurts. But beta readers, especially GOOD beta readers are hard to find. A MAJOR limitation to beta readers? We have to finish the book before we get critique. In my opinion, life is short. Why waste it writing books with fatally flawed plots? This is why I started WWBC (my critique group). I didn’t want to waste months writing a book that had a flawed skeleton. I don’t like having revisions from hell. I prefer to dedicate my time to books that actually stand a chance of being published. If you can’t find a non-traditional critique group or a good beta reader, then just modify the content you bring to critique. This is part of what we do in my writing group WWBC. We employ what I call Concept Critique. We do things a bit differently, but I have modified our methods to work for you. Instead of bringing the first fifteen pages of your novel, write a fifteen page synopsis based off what you did when you were plotting with the index cards (discussed in Part Eight of my Structure Series). Or, for those pantsers, go back and use cards to show the scenes of the WIP you’ve written. Every scene card had a one-sentence summary, so writing a synopsis now should be a piece of cake. Write your one-sentence log-line at the top so they can critique that too, and also so they can make sure your synopsis supports the log-line. If we are finished with a novel and it is solid and ready for critique, we should be able to say what our entire book is about in ONE sentence. (If you need help learning how to do this, then check out the above link about log-lines). We should also be able to clearly see scenes and sequels in our WIP. Detailing our finished WIP scene-by-scene for concept critique is a far better use of time than taking a year to get line-edit on a potentially flawed WIP. Let your brilliant writer friends chime in on what they think of your story as a whole. Is it contrived? Is it convoluted? Boring? Does this synopsis sound like a book they are dying to read? Can they tell who the antagonist is? Is your antagonist a mustache-twirler or the stuff of greatness? Once you have your novel as a whole critiqued, take it to the next step. The next week take Act One and write a fifteen page synopsis of what happens in Act One. Get critique. Clean it up. Then, take Act Two and Act Three and do the same. Write fifteen page synopses about what happens in each act. Then take it to the next step. Break your act into scenes and write a summary of what happens in each scene. This way you are cleaning up your concept. You are going beyond the prose. Your fellow writers NOW can help you by brainstorming better ways to build your mousetrap. And, since they have an idea of the BIG picture, their advice will be a lot better. They might even be able to offer insight into how to fix the idea before you invest the next year writing a book that is doomed from day one because the original idea needed to be fortified before it could support 60-100,000 words. Or, if you have already written the novel, you will have a better idea how to tackle revisions. Once you have solid critique on all these summaries, take off and write/revise that novel. Now it will be way easier because you know where you are going. Also, because your writer friends helped in the planning phase, they will be better trained to see flaws once they critique your final product. They will know why Gertrude is torching Cinderella’s castle. I am going to warn you. This method will test your mettle. In traditional critique, we can hide behind our pretty prose. Concept Critique means laying our baby out there bare bones, warts and all. This will show us why we are really in a writing group. Is it because we really want to succeed at this writing thing? Or, are you like I used to be? I wrote really awesome prose and I got to hear every week how wonderful I was (even though the big picture was fatally flawed). I could believe the standard lies many of us tell ourselves when we are unpublished. I just haven’t found the right agent. Oh, it’s because my novel is a mix of genres. New York just doesn’t publish any good writing anymore. I hear vampires are hot and they are only taking vampire books. Vampires are passe and they are only taking books with trained ferrets. When I started WWBC I had to check my ego at the door. Now I couldn’t hide behind my glorious prose. If someone beat the hell out of my synopsis, there was nowhere to hide. I couldn’t use the Standard Issue Line of Writer Denial–-Well, they just haven’t read the rest of my novel. If they had, they wouldn’t say that. If we really long to be successfully published, then we need to hear the truth. As I like to say, Excellence begins with honesty. If we are attending a group only to hear how every word we write is a golden nugget of joy, we aren’t going to grow. What are some of the problems you’ve had with critique groups? How did you overcome them? Any suggestions? Opinions? Are We Being a Responsible Novel Parent or a Deadbeat Book-Daddy? So this is the year. You are finally going to do it. You’re going to write a…no, you are going to finish that novel. How many of you have a bazillion ideas whirling around your gray matter at all times? How many of you have at least a half a bazillion ideas started and left unfinished? They are lurking in your documents, smoking and picking on the short stories. Maybe even writing gang tags on your recycle bin. The Unfinished are a miserable lot. Their lives began with such hope and promise, but then they were abandoned without so much as a good-bye. We are their deadbeat parents, promising that this weekend we’re going to spend quality time with them. But, we don’t. Why? Most of us are skilled at making babies, but we fail big time when it comes to being good parents capable of nurturing an embryonic idea to a successful novel. Like “parenting,” we writers need to learn certain skills and gain good habits. We aren’t magically mystically born knowing this stuff. This is why I get such a bee in my bonnet when writers won’t say with pride, “I am a writer.” No aspiring. Aspiring writers aren’t responsible parents. They are the “Deadbeat Book-Daddy” of the writing world. They hang out with their writing when it is convenient and fun, and fail to stick it through when stuff gets hard. They don’t invest time, money, and resources into nurturing their work and maturing it into something they can be proud of and brag about. And I am not busting your chops. I have a fair amount of Unfinished lurking in my computer too. They hang out with the spam cookies and send me e-mail about my inheritance in Ghana. But, I love them. They are mine. Some will one day be able to go to reform school. Others? Yeah…..we just won’t talk about them. They drool and say Baby Ruth a lot. No one is going to fault any of us for making bad babies in our ignorance. My blog lessons, however, are here to educate you about how to take an idea and then lay a plan to grow it into a thing of beauty. We have spent two months talking about structure. If you are new to the blog and want to write a novel, I highly recommend you go back and read the Structure Series so you have the tools to sally forth with the rest of the class. Part of why ideas get started then abandoned is that writers really don’t get instruction about how to do this novel-writing thing. We believe we are born to write and for some reason that we should already know what we are doing. In our pride, we take off writing, then wake up one day and realize that we have painted ourselves into a corner. This is the point where most of us will do one of two things. Some of us will just give up and wait for the Inspiration Fairy to visit us in our dreams with all the answers. Others of us (yes, I have done both) will at this point (normally 30,000 words in) whip out the Literary Bond-O putty and slather that crap on until we have a “finished” novel that is so complex we don’t even understand it. Why? Because we had to create a secret government conspiracy, an evil twin for our evil twin and a rip in the space-time continuum all to explain why our protag wasn’t where she needed to be on page 100. Here is the blunt truth. You need to be taught your craft. We all do. People with natural musical ability don’t feel they are “cheating” if they learn how to read music or take voice coaching. And I know all your family will believe that writing is easy, because, yes, even a chimpanzee can make a sentence. All right. Enough of that. So, no more Deadbeat Book-Daddy, and hello Responsible Writer Parent. Today we are going to talk about ways your novel can be hijacked, despite your best intentions. Many of you, in an effort to be a Responsible Novel Parent will go out and join a critique group. Excellent…but beware. I am going to explain how traditional critique groups can hijack your dream of being a novelist. But, I will also tell you how to side-step these problems and use the critique group to its maximum advantage. This is my opinion, so take it for what it is. I’m right :D–ha ha ha ha ha ha. Seriously. Traditional critique groups have some strengths. First and foremost, they can clean up a new writer’s prose. When we turned in that high school paper with 60 glorious metaphors on page one, we got an A. Why? Because our teacher’s goal was to teach us how to use a metaphor properly. Her job was not to train us for publication in New York. In a good traditional critique group you will learn that POV does not mean Prisoners of Vietnam. You will learn to spot passive voice. You will hopefully learn self-discipline in that you need to attend regularly and contribute. You will forge friendships and a support network. The problem with traditional critique groups is that they lack the ability to properly judge the quality of a novel. Once a week reading fifteen pages only cleans up shoddy prose. Traditional critique groups are looking at a work the size of a skyscraper with a magnifying glass. They lack the perceptual distance to see flaws. A novel can have perfect prose page to page and yet have catastrophic faults. Traditional critique groups can hurt you in the following ways. Get you in a habit of over-explaining—In a traditional critique group, those sitting at the table can’t see the big picture. It is hard to pick up a story on page 86 and understand what is going on. Our fellow writers care about us and believe if they don’t say something that they aren’t helping. Thus, they will say things akin to, “But how did Cassandra end up in a meat locker wearing Under-Roos and wielding a chainsaw? I’m lost.” Well, duh, of course they are lost. They have missed the last three weeks and haven’t been keeping up with the story. So learn to resist the urge to over-explain in your prose. Your job is to write a great novel…not 600 individual sections your critique group can follow. Book-by-Committee—Not everyone’s opinion is equally valid. If you are like me and lean to the people-pleasing side, you can get in a nasty habit of trying to please your critique group at the expense of the big picture. Learn discernment and how to stick to your guns, or you will end up with a book-by-committee, also known as Franken-novel. False sense of security—We must always be looking for ways to have our work critiqued by professionals who are willing to be blunt and who possess the skill set to see our errors. Don’t join a writing critique group simply because they say they are a writing critique group. Look at their credentials. How many traditionally published authors has the group produced? I’m not picking on self-publishing, but self-publishing doesn’t have the same rigorous peer review. How many people in the group are career writers, authors, or editors? Gathering together because we love writing is always a great idea, but if the group is solely comprised of hopeful unpubbed writers, the critique will be limited. Limited is fine, so long as we make sure to reach beyond our group for additional critique. Also make sure this group is producing successful novelists. I began Warrior Writer Boot Camp because my old group of six years produced many successful articles, short stories and NF, but they had never produced a successfully published novel. I knew I had to create a different critique format capable of critiquing a leviathan work of 100,000 words. Some writers naturally understand structure, and so they do fine in the traditional setting. I didn’t naturally understand structure, and my novel ended up on so many bunny trails I needed a pack of plot-sniffing dogs and a GPS to find my original idea. If you are the same, then make sure you take traditional critique for what it is…critique of prose. You might need to find or start another group on your own dedicated to looking at the big picture. Or…be creative. If you can’t go to the mountain, make the mountain come to you. Modify the content you bring to critique. Instead of bringing the first fifteen pages of your novel, write a fifteen page synopsis based off what you did when you were plotting with the index cards (discussed last week). Every scene card had a one-sentence summary, so writing a synopsis now should be a piece of cake. Write your one-sentence log-line at the top so they can critique that too, and also so they can make sure your synopsis supports the log-line. Let your brilliant writer friends chime in on what they think of your story as a whole. Is it contrived? Is it convoluted? Boring? Does this synopsis sound like a book they are dying to read? Can they tell who the antagonist is? Is your antagonist dumb or the stuff of greatness? This way you are cleaning up your concept. You are going beyond the prose. Your fellow writers NOW can help you by brainstorming better ways to build your mousetrap. They can offer insight into how to fix the idea before you invest the next year writing a book that is doomed from day one because the original idea needed to be fortified before it could support 60-100,000 words. Once you have solid critique on all these summaries, take off and write that novel. Now it will be way easier because you know where you are going. Also, because your writer friends helped in the planning phase, they will be better trained to see flaws once they critique your final product. They will know why Cassandra is in the meat locker wearing Under-Roos and wielding a chainsaw. I am going to warn you. This method will test your mettle. In traditional critique, we can hide behind our pretty prose. Concept Critique means laying our baby out there bare bones, warts and all. This will show you why you are in a writing group. Is it because you really want to succeed at this writing thing? Or, are you like me? I wrote really awesome prose and I got to hear every week how wonderful I was (even though the big picture was fatally flawed). I had to check my ego at the door when I started WWBC. Now I couldn’t hide. My ideas and story took a beating…but produced a final synopsis/outline that was brilliant (mostly because of my brilliant writer peers). Being a Responsible Novel Parent can be tough on the ego. We have to face up to our “kid’s” problems and then look for ways to fix them. This means admitting we don’t know everything and being humble enough to look for genuine outside help. Does our “kid” have Novel ADD and go off on a zillion bunny trails? Does our “kid” have Story Autism? It’s in its own little world and not connecting with outsiders? Novel Development Issues are not a sentence for our “kid” to be one of “The Unfinished.” Concept Critique will help diagnose these developmental issues, and then give you ways to solve them so your novel can have an excellent life and be a “kid” any writer parent would be proud to claim…and brag about…a lot. What are your biggest “Novel Parenting” issues? Problems? Concerns? What do you feel about critique groups? Are they helpful or do more harm than good? Do you guys have ideas for other ways you could re-tool a traditional critique group to be able to better see the big picture? I love hearing from you guys. Give yourself the gift of success so you can ROCK 2011. My best-selling book We Are Not Alone–The Writers Guide to Social Media is recommended by literary agents and endorsed by NY Times best-selling authors. My method is free, fast, simple and leaves time to write more books. Put that gift card you got for Christmas to good use, ;). Today is Free-for-All Friday, so it’s my choice for topics. Today I am going to do something a tad unusual. A book review. Now I don’t get asked to do a lot of these. I think it has something to do with my reputation preceding me. When you earn nicknames like “The Shredder” and “The Death Star,” you generally don’t have writers lining up around the block to hand over their baby. Fair enough. I do tend to be picky. Almost ten years as an editor has made me more than a little odd, and I do find it tough to read fiction without my Inner Red Pen tagging along. But I am a HUGE fan of Jody’s blog, so I figured I’d show some writer support and read her book. Boy am I glad I did! I enjoy fiction and usually read a few chapters a day. I take the good and the bad. But, every once in a while, I am blessed with a rare opportunity to remember my life before the red pen, to recall how it felt to be a reader held captive by a story. This past Sunday, I cracked open Jody Hedlund’s The Preacher’s Bride. It’s a Christian Romance and really not the genre I ever read in my spare time. I figured out on page one that likely there wouldn’t be a single autopsy, explosion or car chase. But, the funny thing is that even though this book was so far from what I normally would read for pleasure, it caught me on the first page and didn’t let go until I had finished. I sat glued to my couch all day. I would say, “Okay, I’ll just finish this chapter, and then I’ll get up.” Yeah, well I did that all the way to the end of the book. I read from 10:00 Sunday morning until 9:00 that night. Just to give some perspective, that has happened only 3 times in 8 years, and I generally read at least a book a week. Jody is a master of tightening the noose of conflict and suspense. Readers will love The Preacher’s Bride for the story, and writers should love her for the lessons her story can teach all of us about writing great fiction. Jody’s novel breathes new life into the pages of history. The Preacher’s Bride is set in England right before the Puritans will be forced to leave for America to escape persecution. Jody drops the reader right into this historical setting and makes it once more alive and real, filled with real people with real lives and real problems. This love story is surrounded by death, disease, persecution, loss and hardship. Thus, when love does emerge, it is like the lone bud that struggles through the winter snows to remind us that life is good and right and worth fighting for. Jody’s characters are rich, vibrant, and distinct. Her protagonists are wonderfully imperfect and multi-dimensional. I love how this story glorifies so many of the character traits that modern society overlooks—being a hard worker, having a heart for service, and genuinely giving to others. The heroine isn’t supermodel beautiful, but has tremendous qualities of the heart that make her beautiful, and better still, identifiable. The hero is flawed and real and noble. What’s the best of all is that Jody’s antagonists are deliciously wicked and create gripping conflict throughout. This is a romance with substance and grit that will leave you breathless. Jody does a brilliant job of layering conflict in a way that never allows the reader to grow too comfortable. I highly, highly recommend this book, no matter what genre you normally read. The Preacher’s Bride is a page-turning treat that will make you laugh, cry and cheer. Great stories are great stories, plain and simple. Like all great stories, The Preacher’s Bride will leave you feeling encouraged and inspired, and we all could use more of that :D.